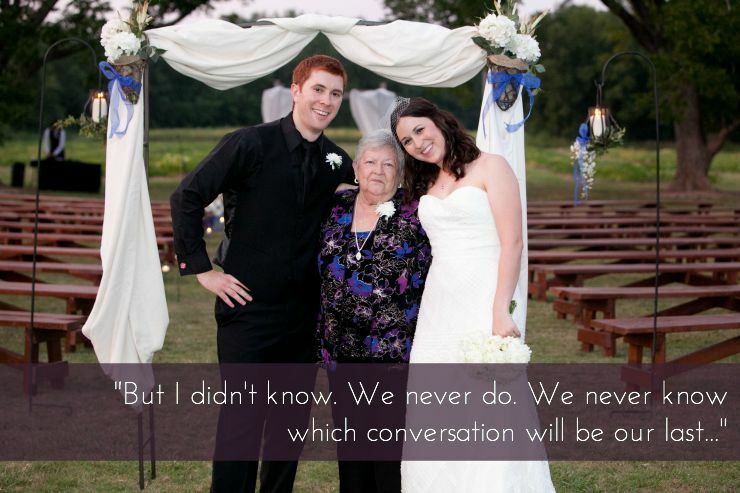 This last Saturday, I spoke to my grandmother for the last time. I did not know it was the last time of course. If I had known, I would have paid better attention to the sound of her voice so that I could always recall its exact pitch and tone. If I had known, I would have asked if we could chat just a second longer when she asked that I pass the phone to my sister. If I had known, I would have told her that I loved her a second and even a third time. If I had known, I would have asked her to tell me a story about my dad when he was younger. If I had known, I would have begged her to stay just a few months longer so she could have met the sweet, sweet life that is still growing inside of me. We never do. We never know which conversation will be our last. We never know which visit will mark the end. We never know which hug will never happen again. I am broken. Absolutely heartbroken. I know that nothing but time will help mend my broken heart. So until then, I'll try to focus on good memories like her feisty attitude and snark and I'll try to come to peace with the fact that the life inside of me will never meet its great-grandmother. I'll try to ignore the loss I feel knowing that she was planning to make this baby a quilt... a quilt it will never be wrapped tight in. I'll try to not regret the time we didn't get and instead treasure the time we did. I'll try to remember that I did at least tell her that I loved her hours before she left this world... she departed knowing that she was loved by me... by her other grandchildren... by her son and daughter. And I suppose that's really all we can really hope for in this life... to be loved and know it. She was loved. Oh so, so, so loved. And she will be missed. Oh so, so, so missed. So sorry for your loss Kate. Sending lots of hugs your way. I am so sorry for the loss of your grandmother - and the loss of what could have been. But you will never lose the memories of her. Praying for you .. I'm so sorry for your loss, but glad that you got that last conversation with her!!! I always treasure that last time I spent with my grandpa before he passed a few days later. I'm so so sorry girl. Sending you lots of positive vibes and prayers for peace for your heart. Sorry about your unexpected loss. So hard. But she's looking down from above and will be your babies guardian angel. I'm so sorry for your loss. You are such a beautiful person, and there is no doubt in my mind that she knows how much you love her. Sorry for your loss. You are right. we never know when is the last time. there's so many words i've said to you about this... so many. but mostly just know i ache beside you and with you. i ache for the way loss happens in a way that's surprising and scary and so very sad. i'm thankful to know you and for the grandma that made you who you are in so many ways. she's awesome. i know because you're awesome and it's got to be genetic. Thinking of you and your family. No words can express what you are feeling.